Q: Why did you decide to focus on office-based physicians who electronically share patient health information (PHI) in the United States? BW: While previous research has looked at the extent to which office-based physicians electronically shared PHI, it has not provided details as to the types of PHI that are electronically sent, received, integrated, and searched for. Therefore, we decided to expand upon this previous research by describing the types of PHI that are shared electronically. Q: How did you collect data for this report? BW: Data from this report were from the 2015 National Electronic Health Records Survey (NEHRS). NEHRS is a nationally representative mixed-mode survey of office-based physicians, and asks about their adoption and use of electronic health records (EHRs). The different modes (or manners) NEHRS uses to collect data are via web, mail, and telephone. Q: What were some of the most observed types of PHI electronically shared in physician offices? 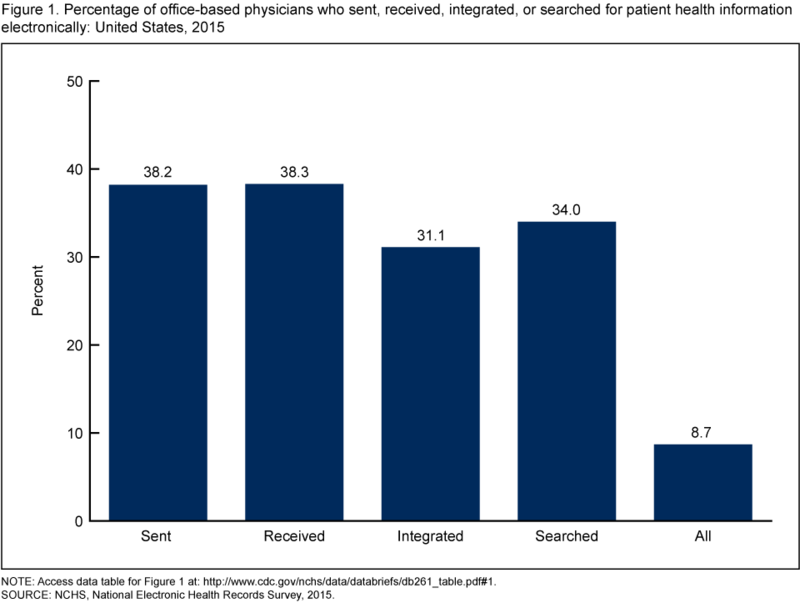 BW: Among office-based physicians who sent PHI electronically, the most commonly observed types of PHI sent were referrals (67.9%), laboratory results (67.2%), and medication lists (65.1%). Among physicians who received PHI electronically, the most commonly observed types of PHI received were laboratory results (78.8%), imaging reports (60.8%), and medication lists (54.4%). For physicians who integrated PHI electronically, the most commonly observed types of PHI integrated were laboratory results (73.2%), imaging reports (49.8%), and hospital discharge summaries (48.7%). Finally, a large majority of physicians who searched for PHI electronically did so for medication lists (90.2%), medication allergy lists (88.2%), and hospital discharge summaries (80.4%). Q: Do you have trend data that is older than 2015 or is this the first this data has been published? BW: Older NEHRS data are available, dating back to 2008 (when it was a supplement to the National Ambulatory Medical Care Survey); however, these older data are not compatible with the measures examined in this report. BW: These are the first national estimates of PHI type according to the aspects of interoperability among physicians with EHR systems, and these estimates can be used as a benchmark for future studies. Combined with measures of electronic sharing of PHI by physicians, information on the specific type of PHI shared electronically among office-based physicians will assist in tracking progress outlined in the federal plan for achieving interoperability. In 2016, 26% of residential care communities used electronic health records (EHRs). The percentage that used EHRs was 36% of communities in the Northeast, 41% of communities in the Midwest, 24% of communities in the South, and 17% of communities in the West. Source: National Study of Long-Term Care Providers, 2016 data. https://www.cdc.gov/nchs/nsltcp/index.htm. In 2016, one fourth (26%) of residential care communities used electronic health records (EHRs). The percentage of communities that used EHRs increased with community bed size. The percentage was 12% in communities with 4–10 beds, 28% with 11–25 beds, 35% with 26–50 beds, 43% with 51–100 beds, and 50% with more than 100 beds using EHRs. You are currently browsing the archives for the electronic medical records category.